However big you might be feeling, it might still seem improbable that you are carrying a baby which now weighs around 2.2kg and measures about 50cm in length! While they may not gain much more in length now, this isn't the end of their growing. Your little one will continue to pile on weight at around 225g per week for the next few weeks. 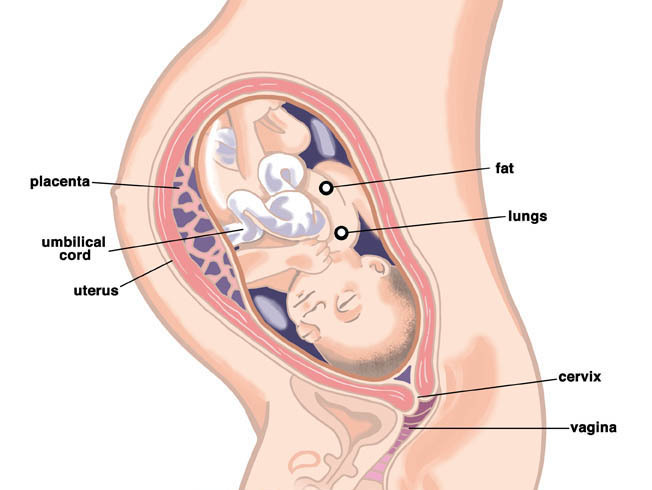 If you are having a boy, then his testicles have been moving down towards his groin area for the last few weeks, but by this week they have probably descended fully into the scrotum. It is possible for little boys to be born without the testicles having fully descended, but this is not usually cause for concern as generally, within the first year they will drop down to where they are supposed to be. There isn't long to go now, and carrying around this ever-growing bump can be exhausting. You have probably heard it a hundred times from other mothers, but it is really important now to make sure that you are getting as much rest as possible. The process of labour and the recovery from either labour or caesarean section can be very draining. Add to that the early days of motherhood with potentially very little sleep and you can soon see why it is good to start with a body that is as rested as possible. At the same time, make sure that you are still partaking in regular exercise, provided your GP or midwife hasn't advised you otherwise. You should have another antenatal appointment with your midwife or GP this week. They will give you information on preparing for the birth of the baby and they will also discuss your birth plan with you. If you had any additional screening tests at your last appointment then you will get the results now. They will also make routine checks of the size of your abdomen, measure your blood pressure, and the levels of protein in your urine. If you are rhesus-D negative then you will be offered your second anti-D treatment at this appointment. You should continue planning the birth and the first few weeks of parenthood now. Have you agreed with your employer when you will begin maternity leave? It is sometimes tempting to plan to work for as long as possible, to give you more paid maternity leave to spend with your baby. However, it is also important that you take some time between work and motherhood to get some rest, gather your thoughts, and relax a little bit! Nobody has a crystal ball and less than 5% of babies arrive on their expected delivery date. There is always the possibility that yours might arrive early. So if you had originally intended to work up to 39 weeks you may want to re-evaluate this decision and give yourself a bit more chance of some time out. Once the baby arrives, they will probably be the sole focus of your attention for some time to come. You've seen the soap operas and sketches where a new mum is still in last night's pyjamas at 2 o'clock in the afternoon, where the cupboards are bare and the house is a mess. However exaggerated these may have seemed to you before, you may well find yourself living one of these cliches in the early weeks of becoming a mother. Firstly, don't set yourself any objectives. Don't make social plans that will be hard to get out of (such as weddings) or schedule important jobs around the house for during this period. You cannot tell yet how easy your time will be to manage. Make life easy for yourself and put your freezer into action. Nutritious meals will be important for your post-birth recovery, and they will also help the battle with tiredness. A healthy diet is also very important if you are breastfeeding. So get cooking in large batches now and freeze your dinners in small bags or containers to help see you through the early days with as little effort as possible. Page generated in 1.3552 seconds.